Built in 1998, this 1999 model, WHALE'S WAY, features 3412's, twin generators, fifth stateroom layout with office/twin bunks. Several updates in 2013/2014. 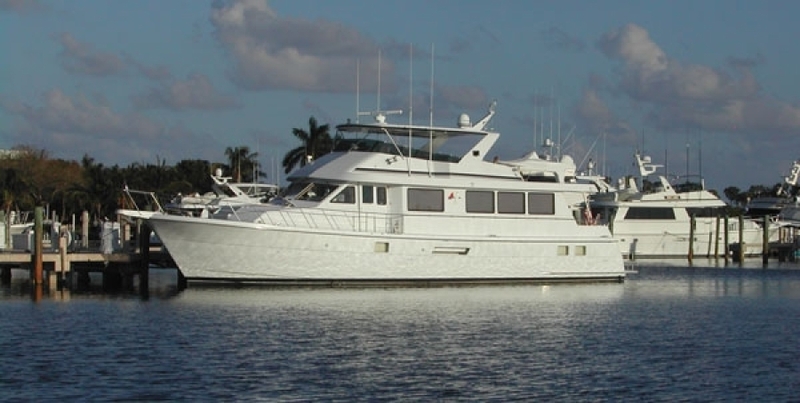 United Yacht Sales New Jersey would love to guide you through a personal showing of this 74' Hatteras Sport Deck 1998. 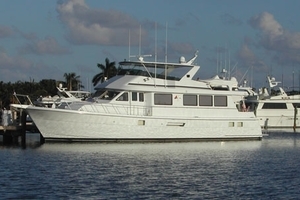 This yacht for sale is located in Miami Beach, Florida and priced at $1,495,000. For a showing please contact us by filling out the form on this page and we will get back to you shortly! Aft Deck has a hardtop for shade, features a table and four chairs, and is surrounded by custom low height rails so that the view is undisturbed. A set of curved stairs lead down from the starboard quarter to the swim platform. There is a large storage area in the transom. The aft salon bulkhead is all glass with double sliding doors. Stepping into the Salon is an L-shaped settee with coffee table to port and a comfortable club chair opposite. A new custom entertainment center/bar houses a 40" LCD flat panel TV, AM/FM stereo receiver with CD player, VCR, DSS receiver and master distribution center and Panasonic phones. Just forward of the Salon is a staircase to access the accommodations below on the starboard side and opposite to port is a Dining area. The entire main deck has great light and visibility with large windows. Next forward is the Galley area to port and built in dinette opposite. There is an oversized counter with glass dish storage, custom divider and lighting between the galley and salon. Flooring in the galley is maple. Equipment includes a double sink, Whrilpool dishwasher, Kitchenaid refrigerator/freezer w/icemaker, Whirlpool 4-burner electric stove, and convection/microwave oven. Next forward is the Pilothouse with maple paneling and flooring. There are sliding doors port and starboard to access the sidedecks. In this area there are also stairs and hatch to the flybridge and a stairwell to access the accommodation below. In this area you will find the AC distribution panels, DC distribution panel, DC electronics panel, AC switching panel, duplex outlets, phone outlet, searchlight, Track Vision Sat TV, autopilot, Navtex NCR 300A with paper readout, and all the appropriate features on the console. Equipment includes: Caterpillar Vision system, Naiad stabilizers, Bow thruster, Garmin GPS Network, Roberston AP 300x autopilot 2X 3010 and 1X 3006, Sea SSB radio and hailer, Datamarine Link sounder, Datamarine Link speed log, wind speed indicator, Furuno 72 mile radar, 941 GPS with remote, Sea 156 VHF, ACR spotlight control. Master Stateroom is below aft with queen berth with adjacent night stands with drawers and built in dressers port and starboard. The head has a Jacuzzi tub and Corian countertops. The stateroom is paneled in maple, has portlights with screens, walk in cedar closet, and built in love seat. There are AC & DC light fixtures, phone, TV, stereo, VCR and DDS Sat TV. A Fifth Stateroom/Office is on the port side just forward of the master cabin and includes built in cabinets and is wired for fax and computer. There is desk and chair, closet and upper/lower berths. VIP Stateroom is below amidships and features a queen bed with upholstered headboard and storage beneath, adjacent nightstands with drawers and dresser. It is paneled in maple. There are portlights with screens, cedar lined closet, AC & DC light fixtures, duplex outlets, telephone outlet, intercom to master stateroom, TV, VCR, and stereo. There is private access to the guest head with Corian countertop and integral sinks, tile flooring, shower/tub/Jacuzzi with bi-fold door, and storage cabinet. Third Guest Stateroom is all the way forward with queen bed with storage beneath, night stand, dressers, cedar lined closet, stereo speakers and phone and private head. Fourth Guest Stateroom is forward on the port side with upper/lower berths, storage beneath and cedar lined closet. The guest head is to starboard with stall shower, counter top with integral sink and storage cabinet beneath. Flybridge has a custom radar arch, molded fiberglass hard top and storage under the console. 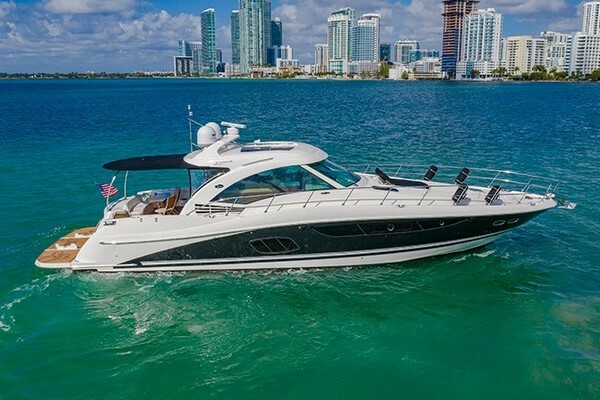 There are stainless grab rails, tinted acrylic windshield, console, Stidd helmsman and companion seats, U-shaped bridge seating, custom bar with icemaker, fridge, sink, stereo and light controls. Aft of the flybridge and lounge area is storage for the 13' Boston Whaler Dauntless and a Marquipt davit.